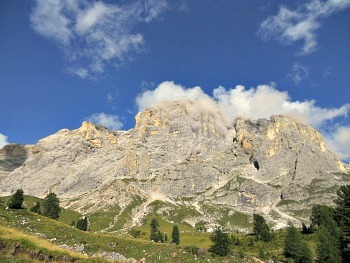 Val Biois: Cultural and Natural Sights Among the Beautiful Dolomites. The Val Biois (Biois valley) – a tributary of the Cordévole valley (val Cordevole) – is usually entered from its bottom end at Cencenìghe Agordino. It takes one first to the winter resort of Falcade (whose traditional wooden houses are pictured above), and then eventually on to Trentino. Intriguing and diverse sights are dotted along the way – the first of these being the village of Vallada Agordina, where there are quite a few items of interest. The main one is undoubtedly the church of San Simòn (St. Simon), known since 1185 but heavily restored in the 1700s, and containing perhaps the most impressive cycle of Renaissance frescoes in the whole Dolomites ("Stories of Christ and Saints"), painted by Paris Bordòn – a follower of Titian – in the late 16th century, and beautifully preserved to this day. Vallada, however, is worth visiting not only for this unique church, but also for its vernacular architecture – mostly houses with wooden frames, built using the traditional ‘Blockbau’ technique, of German origin (a very ancient way of inserting the supporting logs into one another that make a house very resistant, while insulating it almost perfectly). The next village up the valley is Canale d’Agordo, which was anciently also a mining centre – the second most important in the region after Agordo. In the main square there are some interesting buildings, like the Casa delle Regole (1640), with traces of frescoes on the façade, while the 19th century church (architect Giuseppe Segusini) displays an altar by the famous sculptor from Belluno Andrea Brustolon. But this village, perhaps, is best known today as the birthplace of Papa Luciani (John Paul I), and therefore the destination of a certain flux of pilgrims. 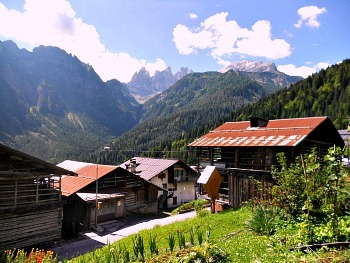 As a note of curiosity, Canale d’Agordo also hosted the first public brewery in Italy (1847), as well as seeing the institution of the first co-operative dairy (1872) – now a common feature throughout the Alps. For the nature lover, the beautiful Valle di Garés – carved between the Pale di San Lucano (2,409 m) and the Pale di San Martino (3,192 m) – can be accessed from here, leading eventually to the tiny hamlet of Garés – a gateway for many treks in un-spoilt conifer forests. Further still up the valley, the final destination is Falcade, mainly known today as a popular winter sports resort – but, in fact, this is quite a limited view of what this town may offer. Situated in the upper reaches of the Val Biois, it is the closest centre from which to access the surrounding mountains of Focobòn (3,054 m) – an outlying range of the more renowned Pale di San Martino (3,192 m), the most extensive mountain group of the Dolomites – and the sub-group of Cima d’Auta (2,623 m). The sights of the more distant Monte Civetta (3,220 m), Pelmo and Marmolada – with its impressive glacier – complete the skyline. Falcade itself displays many examples of well-preserved vernacular architecture, mainly built in wood – especially so in the peripheral hamlets of Falcade Alto (pictured above), Sappade, Somòr and Villotta, but from a cultural point of view, the highlight in Falcade is undoubtedly the “Casa-Museo Murer”, in the hamlet of Molino. Augusto Murer (1922-1985) is a well-known contemporary artist, very much engaged with the events of his time – and perhaps the last sculptor down the line in a region famous for its lineage of talented wood-workers (from Andrea Brustolon to Valentino Pancera – known as the Besarel – to indeed Murer himself). Very attached to his own land and to his mountains, Augusto Murer had this contemporary-looking atelier-home built on purpose in 1972 by architect Giuseppe d'Avanzo, where he lived and worked until his death, after which it was transformed into a space dedicated to exhibitions and cultural events. This certainly makes for the most interesting cultural visit when in Falcade; in the garden, the antropomorphic view of Murer's art – who drew a lot of inspiration from natural forms – is revealed in all of its evidence. 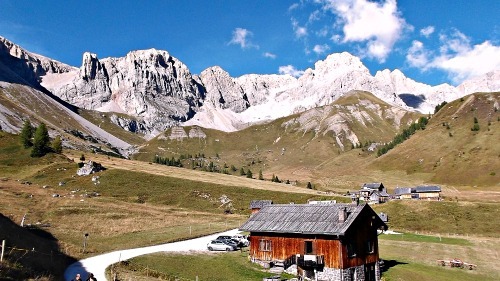 As for more natural pursuits, a bifurcation leads from Falcade further up in altitude to either Passo San Pellegrino (1,946 m) – a serene plateau among verdant pastures that borders with Trentino – or to Passo di Vallès (read below). 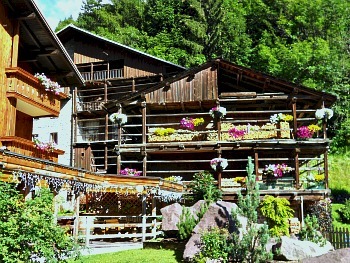 The millenary history of the minuscule village known as Fuciade (pictured above) is all enclosed in its Ladin name: “Fuciade” – that is, a place where scything activities would usually take place (from the Ladin word “Fuciar”; the scythe’s wooden handle). 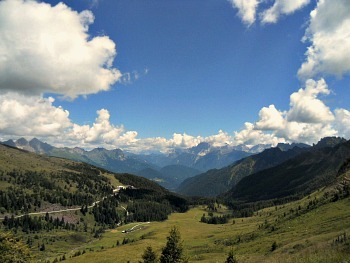 The area is mostly composed of a wide pastureland at 1,800-1,900 metres above sea level, just off the Passo San Pellegrino as one descends towards the Veneto side (from an administrative point of view, however, both the pass and the area of Fuciade befall to Trentino), at the foot of the imposing peak of Cima Uomo (3,010 m). A handful of small huts immersed in the green of open meadows and in sight of the more distant woodlands, crowned by Dolomite rocks and surrounded by absolute silence, is really all there is to the Fuciade area – but that is not little! Of the Rifugio Fuciade (1,982 m) itself, we know that it was built at the beginning of the 1960s by three priests who then gave it in management to local families in order to have it used as small Alpine retreat or mountain hut where to offer simple food such as polenta, sausages and cheese to passing walkers during the summer months. In 1983, the nephew of one of the three priests, together with his wife, saw the possibility to create something special: the original building was restructured, enlarged and furnished with great taste; some rooms were also made available, all rigorously furnished with Ladin pieces, for whoever wanted to experience a different holiday. Over the years, the Rifugio Fuciade has been transformed into something quite unique, and its reputation has spread far and wide across the country, making it a reference point not only for trekkers in the area, but also for people coming from afar to savour the special dishes that are being prepared here, in the respect of the traditional cuisine of Trentino, but mixed creatively with other all-Italian staple ingredients such as olive oil from lake Garda, Balsamic vinegar from Modena and Mediterranean spices. The Rifugio Fuciade can be reached in the summer with a beautiful walk from the Passo San Pellegrino; it is about 45 minutes long, not too strenuous and all on a wide forestry road. In winter the hut can also be accessed via snowmobile. From the Passo di Vallès (2,032 m), there is a retrospective view on the Val Biois (see image above) and all the major Dolomite peaks of the province of Belluno, while ahead the sights open up on to the wild Lagorai chain, also in Trentino. Additionally, a very interesting geological trail starts from the Passo di Vallès, and develops along the slopes of the Pale di San Martino (refer to this page for a full description), providing very interesting insights on the fascinating geological history of the Dolomites (in the final picture below, an image of the Pale as they appear from along the geological trail). In fact, in my opinion, this circular route provides a much more effective way of engaging with quite a difficult subject than reading about it, as the different types of rocks can be admired directly – as indeed in an open book. From the Passo di Vallès one can descend into the Val di Fiemme, in Trentino.